Screenshooter is software that facilitates users' tasks in capturing everything that happens on the PC screen. This screen capture program by Kevin Schneider is simple to handle. 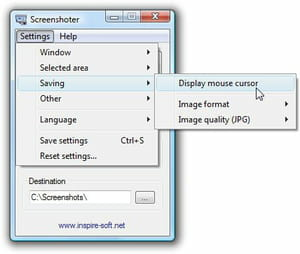 Process: with Screenshooter, taking a screen capture is facilitated. The user just has to launch it, and then choose the action to undertake. It is worth to note that it is possible to record the entire screen or just an area on it. Output format: captured images can be stored on the hard drive for future use. What is interesting is that Screenshooter can record the image in several common formats such as PNG, JPG or BMP, to name just a few. Notebook: another advantage is that Screenshooter is available in a portable version. This means that it does not need installation procedure to work. This means that the program can be carried in a USB drive or flash disk. This is a multilingual program available in English, French and many other languages. It consumes few resources in RAM since it is lightweight. Latest update on November 6, 2014 at 07:33 AM.